The cost of care for people later in life is a source of much media attention and debate. For people and their families that are considering care options, the financial implications and the ongoing cost of care can be a major worry. Looking after a loved one in the right way should be about their individual needs being met and, crucially, quality of life. Government legislation relating to paying for senior care is set at country level, not overall for the UK. Unfortunately, the government provisions for care of the elderly vary according to where you live but very rarely do any provide the kind of care that loved ones want for their relatives and friends. For most people, there is a need to pay for at least some additional care support to provide the quality of life that we feel our loved ones deserve. When looking at care costs, making comparisons to the type of care you or your loved one will receive is vitally important. You should weigh up the outcomes of care, beyond simply providing tasks, to considering the person’s safety, their need for companionship, assistance with hobbies and taking into account shared interests. Care is not something that should be ‘done to you’ but something that is in place to enhance a person’s enjoyment of life. Learn more about how we can help you with the care costs and funding. Many people face a choice between whether their loved one can stay at home or may need to go into a residential care home. It is important at these times to understand that it can be possible to provide the level of care a person needs while allowing them to stay in their own home. This is often less upsetting and is better for the person’s mental wellbeing as moving into a care home can be stressful and confusing for some people. 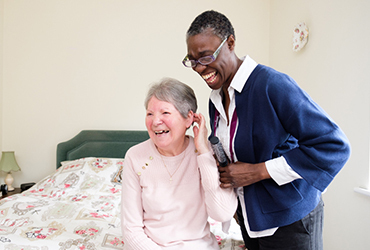 While the choice of care for a loved one should not be made solely on financial grounds, there is often a financial benefit of choosing home care compared to moving into a care home full time. We have written a more in-depth comparison of the cost of care homes compared to home care to provide you with information to help you make an informed choice. Care for your loved one is important to you and you want to ensure that they receive the best quality care at good value for money. Home Instead work differently to the vast majority of home care providers. Founded by a couple who had the challenge of finding care for their elderly mother, Home Instead has always put the needs of the individual first. We start with the needs of the person requiring support or care. This is why you won’t find any packages or prices on our website. It’s not that we are not proud of the value for money we bring to the thousands of people we provide care to, it’s simply that we always develop a bespoke care package around the needs of the individual. Having home care maybe almost a third cheaper than going into a care home. Home Instead operates across 14 countries and, in the UK alone, we have 190 owner managed offices. This means that we can combine our knowledge and efficiencies from across the network to make our care packages as cost effective as possible without ever compromising the care of your loved one. With care being delivered by small, dedicated local teams which are managed by a local business owner, you get all the benefits of a nationally recognised and reputable brand, with local service, personal care and attention. Making sure that it is the same person delivering care to your loved one each day. That the carers they employ are properly trained for the care being provided. That the carers can communicate easily and clearly with your loved one. If they are paying their carers for all the time they are at work, including travel time. Are they incentivising carers to be fast rather than be good at care? That they ensure wellbeing is the priority over functional tick lists. We believe that as people reach old age the care they receive should enhance their lives and improve quality of life. Our highly trained CAREGivers know that the priority is the person, not the timesheet, not the tick list. This means that our ways of providing care can sometimes be slightly more expensive to provide. For example, making sure whenever possible the same person provides care to your loved one every time. Something especially important to care for those people that are living with dementia. Find out more about the cost of care by contacting us or book a free consultation to see how we could support you and your loved one. When it comes to planning the right care for you, it is worth considering the funding routes and benefits that may be available to help you.